QUESTION: Right. I want to start on something that I don’t usually start on here, Sri Lanka. What is your understanding of the situation with the prime minister and the government there? Do you consider the former prime minister to still be the legitimate prime minister? And if you do or if you don’t, do you believe that his ouster was an unconstitutional change in government, which would require – which would be a coup, which would require U.S. action? MR PALLADINO: Yeah. What we would say that we believe – the United States believes the determination should be made in accordance with the Sri Lankan law and due process. But to step back from that, we are following developments in Sri Lanka with concern, and we are – we urge all sides to respect due process. We call on the president, in consultation with the speaker, to reconvene parliament immediately and allow the democratically-elected representatives of Sri Lanka to fulfill their responsibility to affirm who will lead their government. We expect the Government of Sri Lanka to uphold its commitment to human rights, rule of law, reform, accountability, justice, and reconciliation regardless of who occupies that leadership position. QUESTION: I’m sorry. Your first answer there – the determination will be made by them? You mean the determination of whether this is a coup or not? What determination? MR PALLADINO: Leadership in Sri Lanka. We call for it to be made in determination with Sri Lankan law and due process. QUESTION: But it’s your responsibility – the U.S. government’s law – that says that you have to – I realize the previous administration found a crazy way around this in Egypt. But if you determine – and you should make that determination – whether the government was changed unconstitutionally, there should be some kind of consequence legally. 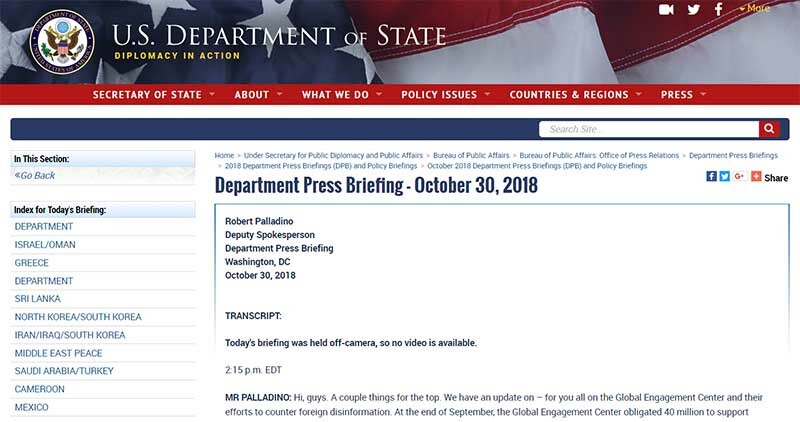 MR PALLADINO: We call on the president of Sri Lanka, again, to reconvene his parliament and to allow the democratically elected representatives of the Sri Lankan people to fulfill their responsibility in accordance with Sri Lankan law and due process to determine the leadership of their government. And I have no further information on this subject. QUESTION: So in other words, you have not made a determination one way or another? MR PALLADINO: We call – this determination needs to be made in accordance with due process and Sri Lankan law. That’s the United States’ position. QUESTION: I’m not talking about the determination of who leads the country. I’m talking about the U.S. determination on whether what happened was an unconstitutional change in democratically elected government. MR PALLADINO: We’re following it closely with concern, and I’ll leave it at that. QUESTION: Can I follow up? Can we have a follow-up on it? MR PALLADINO: AFP. And I don’t have much more than this. I’m sorry, Shaun, but go ahead.